Leo is one of the few Chicago high schools to offer a competitive boxing program, under the tutelage of Mike Joyce ‘86, an attorney and former professional fighter who remains an influential figure in Chicago boxing circles, training and managing young fighters through the Celtic Youth Foundation. 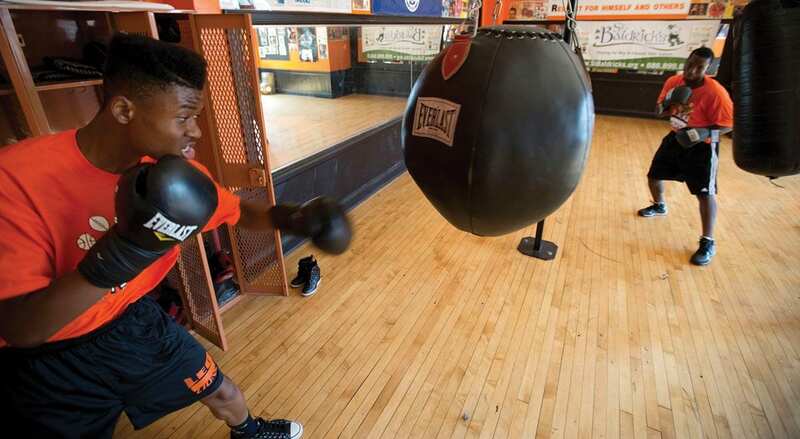 Boxing at Leo is an after-school program that caters to aspirants on many levels. Students who are truly serious about training and developing their boxing skills might qualify for entry into the Golden Gloves or other amateur competitions. Others use the training as off-season conditioning between their other sports. For those who have never tried boxing before, the program is an opportunity to improve their fitness and self-confidence. At Coach Joyce’s insistence, rigorous safety measures are always in place. Middleweight John Collins ‘79 and heavyweight Thomas Hayes ‘99 are among the Leo alums who have made a mark as professional fighters. Lamar Fenner ‘02 served as captain of the USA Boxing Team after competing for the U.S. Military Academy, West Point.